Halo is a term applied to all manner of circles, arcs, and spots of light that appear in the air (above and below the horizon) and have their origin in the refraction or reflection of light by ice crystals. (This is as distinct from rainbows, coronae and glories, which depend upon water drops). Haloes come in a greater profusion than rainbows, so in time, this page is likely to have a wide variety of images. 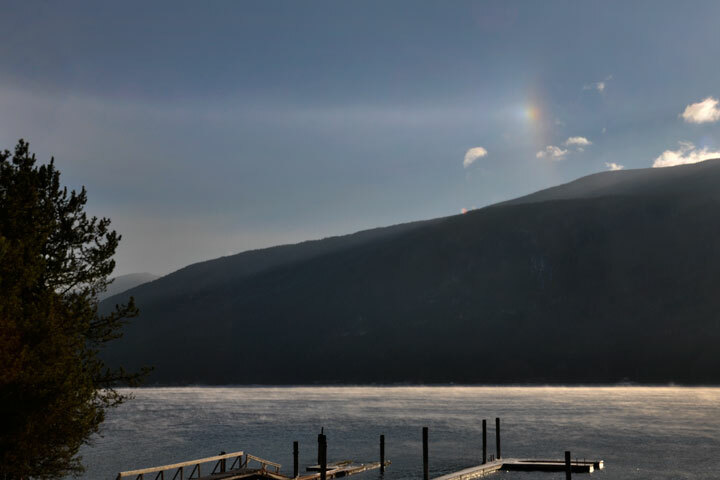 A 22° halo appears over the south shore mountains, as seen from Crescent Bay. 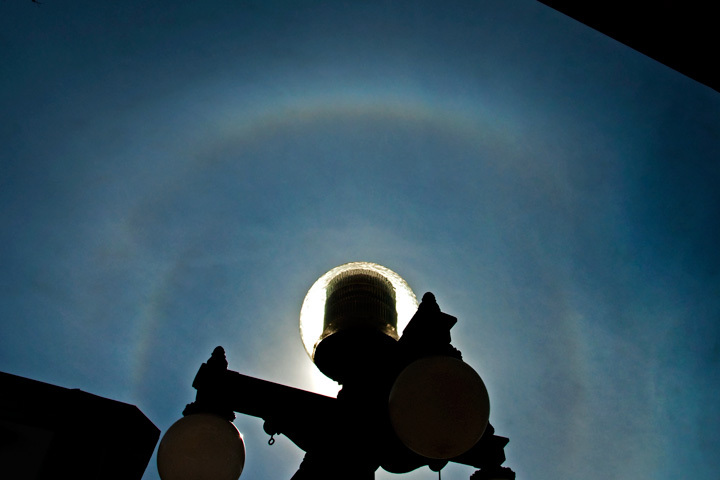 Perhaps the most commonly seen member of the large family of ice-crystal optics is the 22° halo. The name describes the angular radius: a line extended from the observer’s eye to the Sun and another one to any point on the halo will make an angle of 22° to each other. Of course, the fact that the halo is named after its angular radius suggest that there are haloes with other sizes; there are, but this one is the one most commonly seen. Now, the Sun has an angular diameter of 1/2° and so is very small compared to the 44° diameter of the halo. The discrepancy in size does not look nearly this great in the picture, because you don’t actually see the Sun, but rather the over-exposed sky surrounding it. 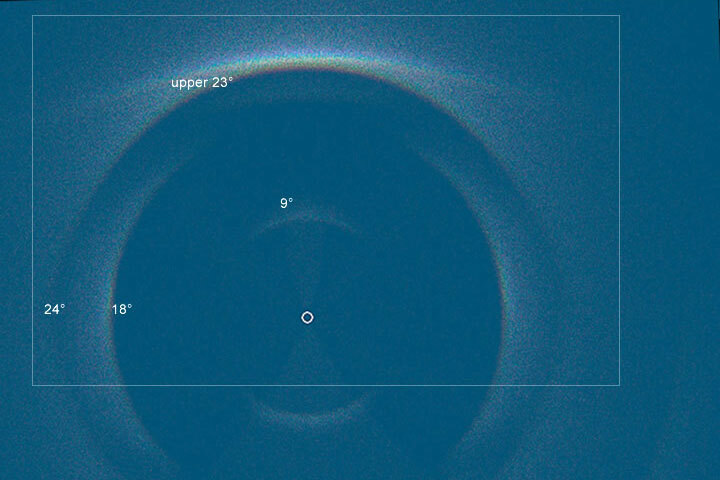 A simple test to see if you are looking at the 22° halo, as opposed to some other one, is to extend your arm to full length and to spread your fingers as wide as possible. Put your thumb over the Sun; if your little finger is close to touching the halo, then it is a 22° halo. The 46° halo is over twice as big (about two hand spans radius), while the very rare 8° halo would fit well within the span of your hand. Any very wide angle view, such as this has distortion—it is a problem of how one maps the spherical dome of the sky onto a plane. If I had chosen to make the horizon straight, the halo would have been distorted into a non-circular shape; I chose to render the halo as circle, as it would appear to the eye, and let the horizon smile. The Kokanee-Creek Narrows are seen on the left and the Nine-Mile Narrows are seen on the right of the picture. 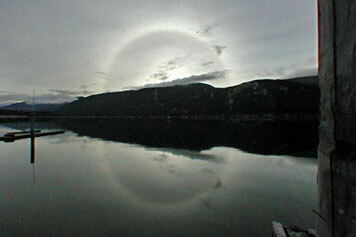 Halo and reflection The winter Sun is low in the sky over the south shore of the West Arm and the Lake is calm. 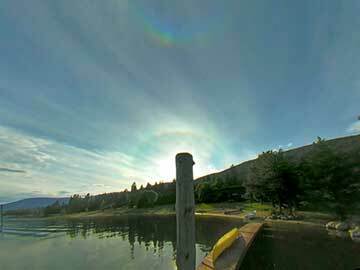 A 22° halo is reflected in the Lake in such a way that the two half circles give the combined impression of an ellipse with a vertical axis. This halo has the same angular size as the one above; it is merely presented as a smaller image. Sundog (parhelion) Often one can see bright, coloured spots of light to the left and right of the Sun at an angular distance of 22° or more. As the Sun moves across the sky, the spots accompany it, rather as a dog does its master. Possibly this is the origin of one of the names for this phenomenon which is also known as a mock sun and a parhelion (par=beside, helion=sun). 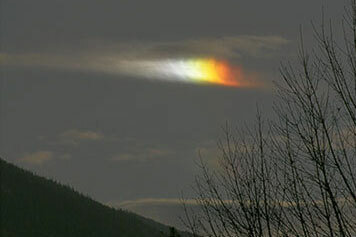 The sundog is explained by the refraction of sunlight through ice crystals in the form of large hexagonal plates. Large plates fall with their flat surfaces nearly horizontally, so the spots appear to either side of the Sun. Had the crystals been smaller, brownian motion would have disoriented them and parts of the 22° halo would have been produced. Red is always to the inside (next to the Sun) so this sundog sits to the left of the Sun. This is a telephoto shot, the sundog is much smaller than the halo. A parhelion and a parhelic circle, extending to its left, in November. Below on the Lake, steam fog abounds. 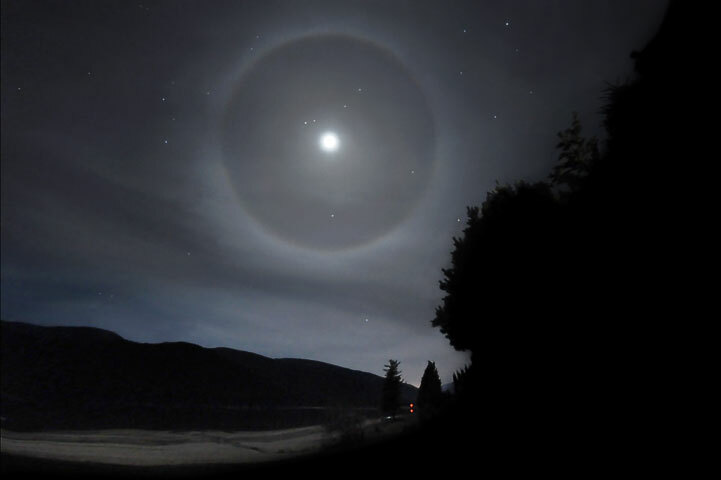 A 22° halo around the Moon. Such a sight is not nearly as common as is a halo around the Sun. Leaving aside the issue of obscuring clouds, the Moon is not always visible at night. Further, it usually requires either a gibbous or full Moon to provide enough light. (On this occasion, it was gibbous, but the Moon was over exposed and so looks full). Of course, the spectral distribution for the Moon's halo is about the same as that for the Sun, but the eye may see no colour as at low light it operates on the rods rather than the cones. The circumzenithal is one of a pair of very colourful arcs. The circumzenithal forms high in the sky when the Sun is low (and so it has a potential of forming every morning and evening); the circumhorizontal forms low in the sky when the Sun is high (and so is only seen in these latitudes around noon near the summer solstice). Explained by refraction through the 90° prism (between top and side faces) of hexagonal ice crystals the circumzenithal arc has its best colours when the Sun is about 22° (a handspan) above the horizon, and it is seen about 22° from the zenith. 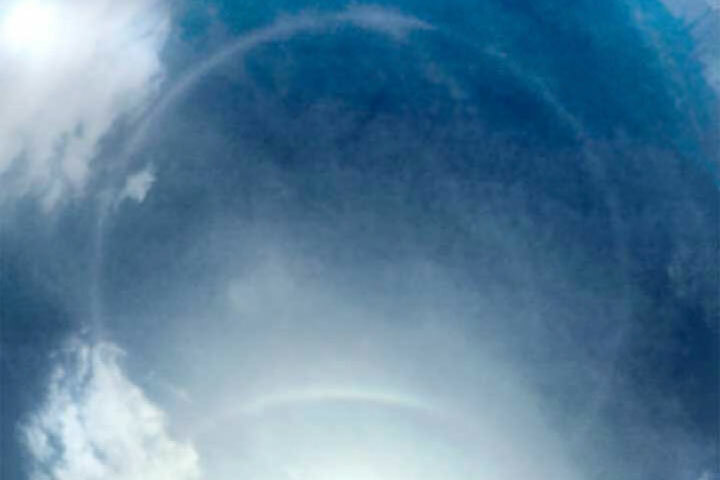 In this picture, it is the coloured band high above the 22° halo seen at the bottom. 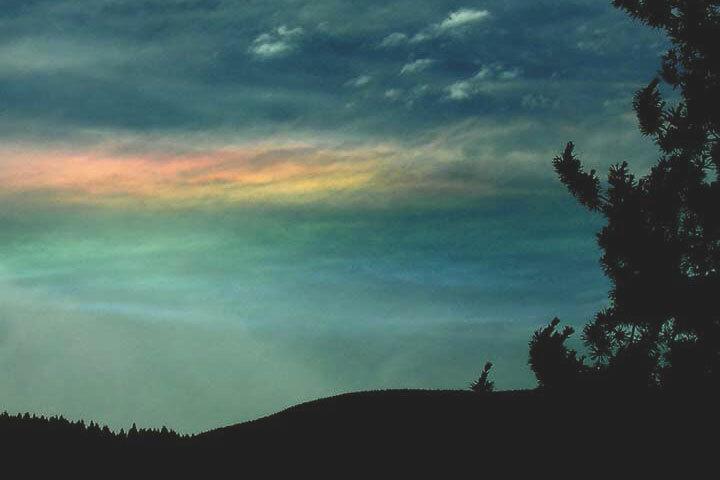 One of the most colourful of haloes, the circumhorizontal arc is rarely seen around the Lake because it can only occur for a short time each year. The arc shows the best colours when the Sun is at an elevation of 68°, but it can form, somewhat less well in the neighbourhood of that value. At Nelson, the Sun reaches a maximum elevation of 64° at solar noon (about 12:50DST) on the summer solstice (June 21). So, for maybe an hour a day, for a week a year, the arc might form locally; these pictures were taken on June 17 at about 12:10 DST). The arc appears about 22° above horizontal. 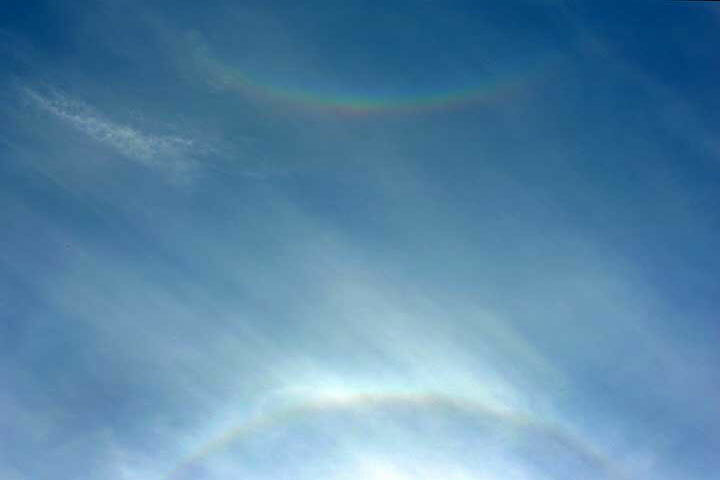 The arc requires the same hexagonal plate ice crystals as those which produce the sundogs, but for sundogs sunlight passes through two non adjacent sides (a 60° prism), while for the circumhorizontal arc sunlight passes in a vertical side and out of the horizontal base (a 90° prism). 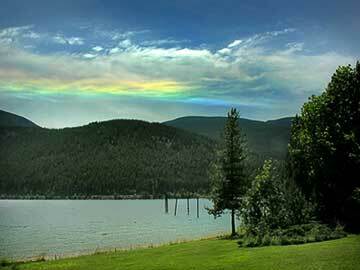 Seeing the circumhorizontal arc at Kootenay Lake is rather like seeing a rare bird on the northern limit of its range. The Parhelic Circle is a white arc which passes through the Sun and circles the horizon (and so is centred on the zenith). In this picture, the camera was pointed straight up, so it is the white arc centred in the picture; at the bottom of the picture is the upper portion of a (somewhat overexposed) 22° halo. Unlike many of the other haloes, this one is explained by the reflection of sunlight off the vertical faces of ice crystals. Imagine a circular room whose walls are covered in mirrors. A single light will be reflected as a line circling the room. 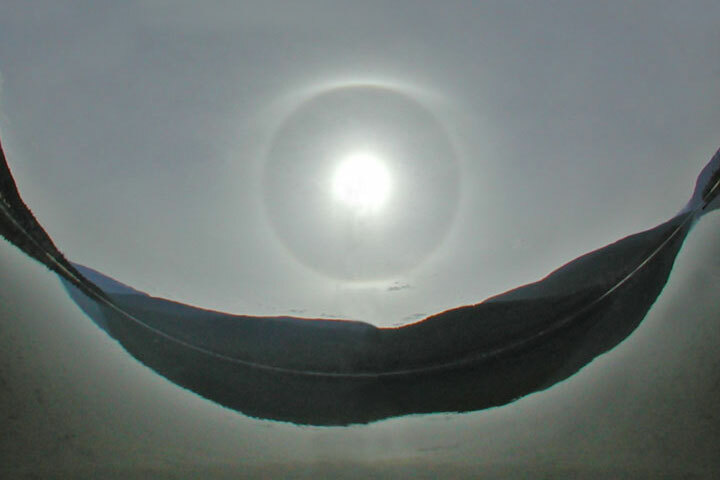 This unusual halo display was recorded on Baker Street, Nelson at noon on March 12, 2009. Its dominant features are the 18° plate arcs, seen to either side of the Sun, and the 23° upper plate arc seen above the Sun. A computer simulation of this halo by Les Cowley is presented in the next image. This is a computer simulation of the Nelson halo of March 12, 2009 (see picture above) done by Les Cowley. The pyramidal ice crystals which produce the halo, while quite rare, are well known. The light paths which produce the various features are shown in the insert diagram. Further details are available from Cowley’s site (just click). Les Cowley has a website about Atmospheric Optics. His simulation of the Nelson 18° halo is presented at Pyramidal Plate Arcs.